Flowers, cake, flowers, cake… if you’re struggling to decide just how to spoil your mum on Mother’s Day, you can’t go wrong by going home-made. Ever since you brought home glitter-sprinkled cards from school and ‘treated’ her to a barely-edible breakfast in bed, there’s been nothing more likely to bring a smile to her face than a gift you’ve made yourself. And if you know your way around a mixing bowl and an icing nozzle, this beautiful bouquet-topped bake is a lovely way to show you care – and will settle the whole flowers/cake debate too. ‘Real’ flowers might last a little longer, but they won’t taste as good! While your cake’s in the oven, make a start on the chocolate shards to go round the outside. Line two oven trays with baking parchment – and clear the same amount of space in your fridge. Break up 800g of white chocolate into pieces and place in a large, heatproof bowl. Melt in the microwave or over a pan of simmering water, then divide the melted chocolate between the trays. Smooth out using the back of a spoon to form two large slabs, each about 3-4mm thick. Put the trays in the fridge and leave to set. 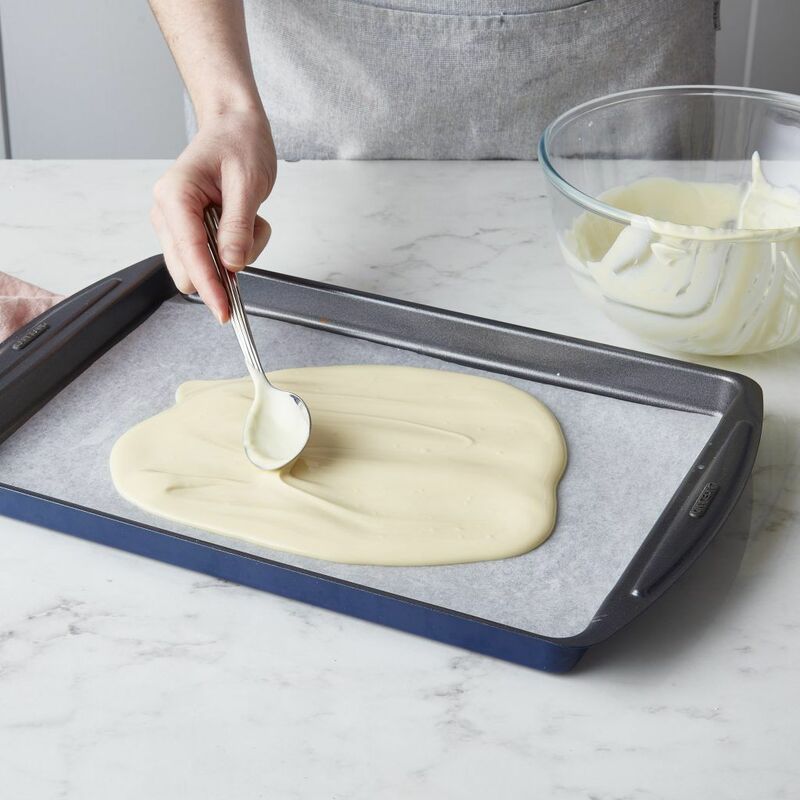 Once your cake’s baked and cooled, pop it on a cake stand (if it doesn’t have to travel anywhere) or a cake board (if it does). 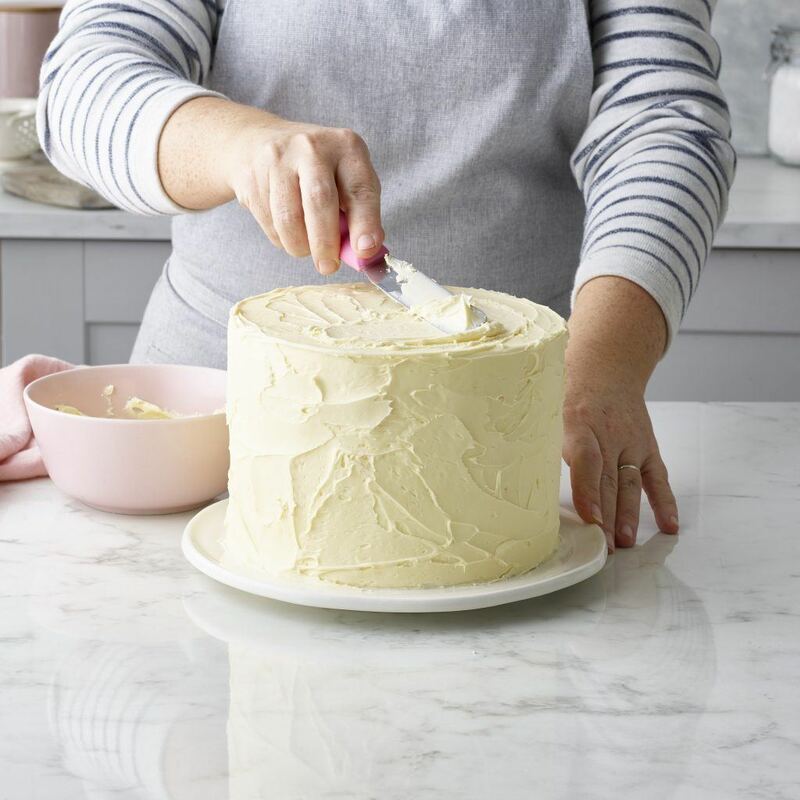 Cover it in a generous layer of vanilla frosting – we used one 400g tub of Renshaw Vanilla Frosting, holding a little back to help attach the shards at the end. Start off your bouquet with that Mother’s Day classic – pink roses. 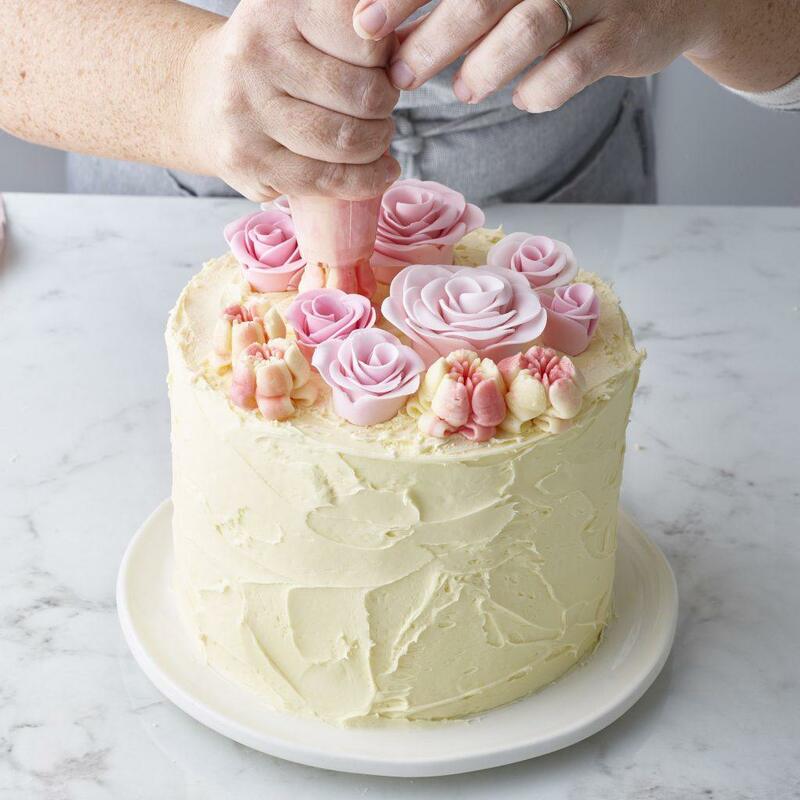 Knead a little pink food colouring into white petal paste, then follow the instructions in our Floral Cakes blog to fashion your flowers. We made eight, in different sizes from just-out-of-the-bud to full-blown blooms, and in two different shades of pink – just add a little more pink food colouring to get a deeper shade. For buds and smaller blooms, cut the paste into two smaller shapes before rolling; to make large blooms, add another strip of petals. 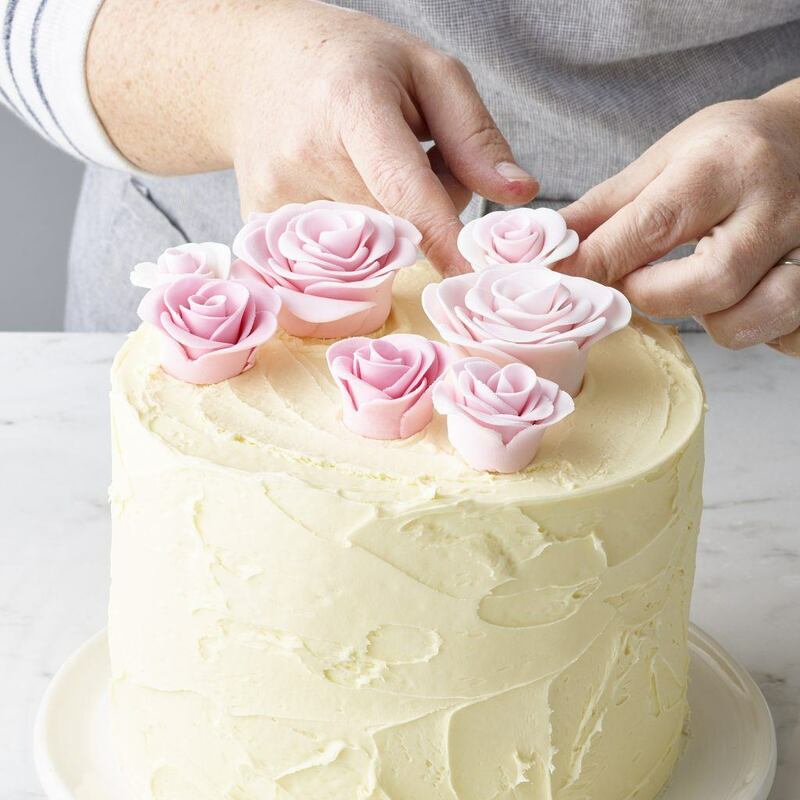 Once your roses have set, cut off the bottom of each to make a flat surface for easier positioning and arrange them on top of the cake, leaving enough space between them to add piped flowers and foliage. Mix up some stiff buttercream (we used an Italian meringue buttercream recipe as it holds its shape better than the ‘normal’ butter-and-icing-sugar mix) and divide it between two bowls. 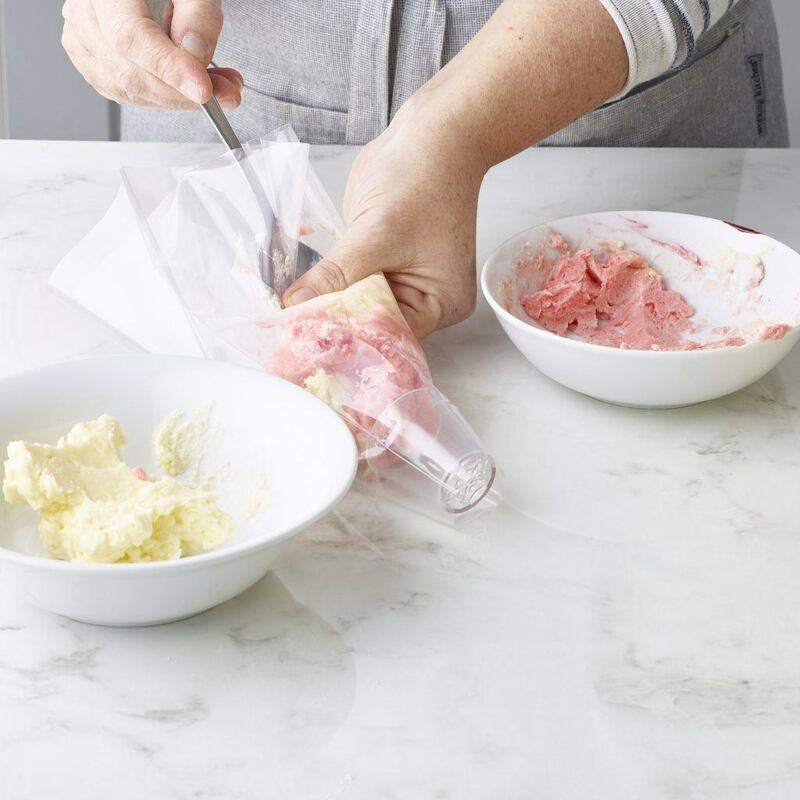 Colour one bowl with a little pink food colouring – this will blend with the natural yellow of the buttercream to make a peachy colour – and leave the rest uncoloured. 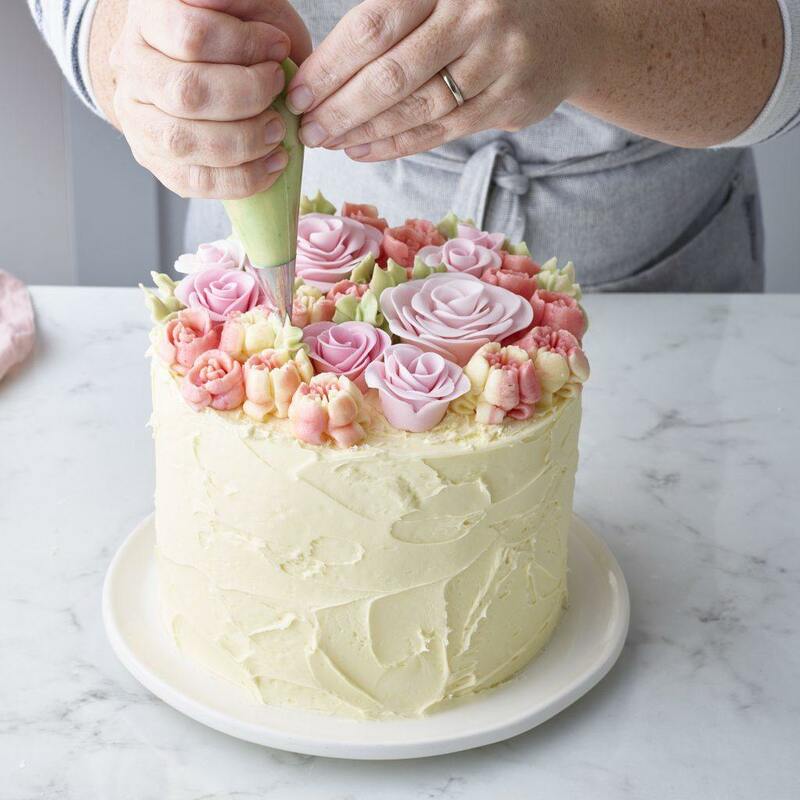 Fit the open tulip petals nozzle from our Russian Nozzle Icing Set to a piping bag and spoon in equal amounts of both plain and coloured buttercream – this will give a two-tone effect to your flowers. Holding the bag upright, pipe tulips onto the top of your cake between the roses. 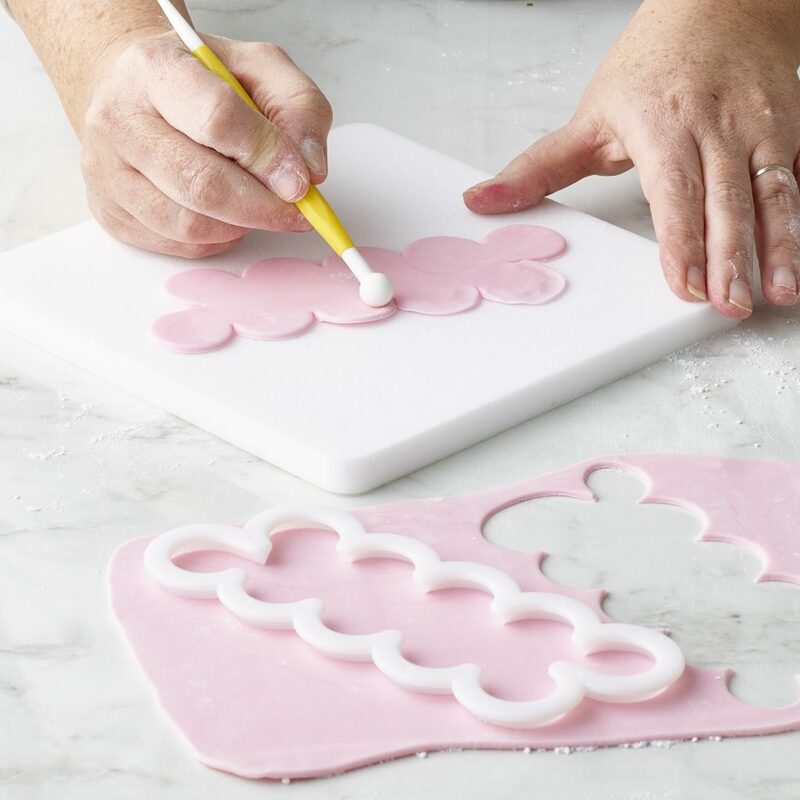 Aim to fill about half the remaining space this way, then switch to a piping bag fitted with the closed tulip petals nozzle and continue piping until the top of your cake is covered with blooms. To add a little foliage in between your flowers, colour the remaining plain buttercream with green food colouring and fill in any gaps with leaves piped with a leaf nozzle – we used the number 10 nozzle from our Complete Cake Decorating Set. Finish off by using a small round piping nozzle (we used number 5 from the same set) to add small dots of white royal icing on top of the green leaves. 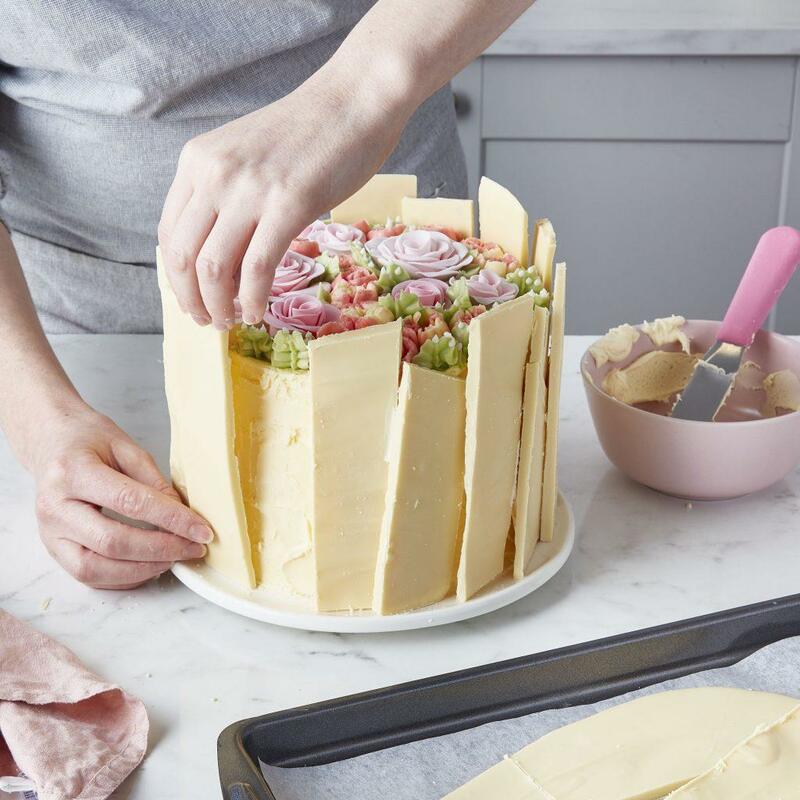 Once you’re happy with your flowers, it’s time to add the finishing touch of the shards around the cake. Take the baking trays out of the fridge and check that the chocolate has set hard. Lift out the chocolate using the baking parchment, place on a chopping board and use a sharp knife to cut into shards of different lengths and thicknesses. Arrange these around the outside of your cake, using a blob of frosting on the back of each one to help keep them in place. Et voila! A bloomin’ marvellous cake fit for a queen/your mum. Happy eating – and happy Mother’s Day!